Domain companies aren’t known for good user interfaces. Here are a few suggestions to help. A user interface designer charges a couple hundred bucks an hour to help companies improve user experience at their web sites. I’m not a UI designer, but I do have some free advice for a few domain companies. Disclaimer: advice is worth what you pay for it. Why does OutsideInvestors.com need to be truncated with all of that extra room (where the red line is)? You have to mouseover the domain to see what it is. 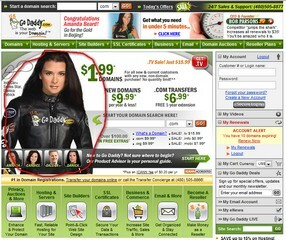 When I order a domain name, I keep assuming Danica will pop up as an upsell during checkout. I can add private registration, a web hosting plan, personalized e-mail, an SSL certificate, a poster of Bob Parsons, a pound of dirt, and a kitchen sink. But I can’t add Danica. What gives? 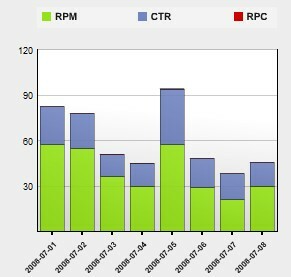 It doesn’t make sense to have a stacked column graph for RPM, CTR, and RPC. Heck, RPC is so small compared to the rest that you can’t even see it. Not to mention that the sum of these three measures doesn’t mean much. A dual-axis line graph might make sense, but this graph means nothing to me. If something frustrates you about another company’s UI, let it rip. Don’t know much about parked.com, but have used both sedo and godaddy. True, both interfaces could be better from my perspective. However, neither of these very successful companies are likely leaving anything to chance, and their interfaces are no doubt the result of indepth testing and results tracking. So like them or not, they have huge user bases and are both very successful. The usability purests would no doubt change things, but commercial online businesses need to find a balance between usability and what actually results in sales. I don’t know…I’ve thought about this, and I just don’t think these companies are advanced on UI. I realize Amazon has a team that tweaks and measures every last pixel. I just don’t see this happening at many of these companies. I was wondering, am I the only one that has problems bidding on Sedo auctions occasionally? Sometimes I go to bid, (i’ve already logged in), and when i click place bids, it takes me back to a login screen. I almost lost an auction over this once. Random other item as well. Every time i go to godaddy.com in my browser it does not resolve the first time. The first time I try to go to that Url (godaddy.com) it does a search based on my default search engine with my browser. If I type it in again, it always works the second time. This happens at my home and office, and on every computer I try, so its either them or me. If I close the browser window and try again it is ok, unless I let it wait like 30 minutes or so. @ jp – I had a problem like that with a site a few months ago. Is your ISP at work the same as at home? It could be a problem with their DNS service. And yes, I’ve had problems like that at Sedo too.